A couple of weeks ago, I got the question from our PR-lead if I would like to do an interview about being a woman in technology, telling my story about what it is like to be in IT and especially for a woman. Within Microsoft there is a strong belief that (gender) diversity within the organisation is a key asset to accelerate in digital transformation and create high performing teams in a cloud era. Next to this Microsoft feels it has an important responsibility to evangelize that technical skills are important to prepare our children and especially girls for a job in the future. Since I firmly believe that working in information technology still has an image challenge among women, I was very energized to cooperate. The same day the questions where sent to me: Is it fun? 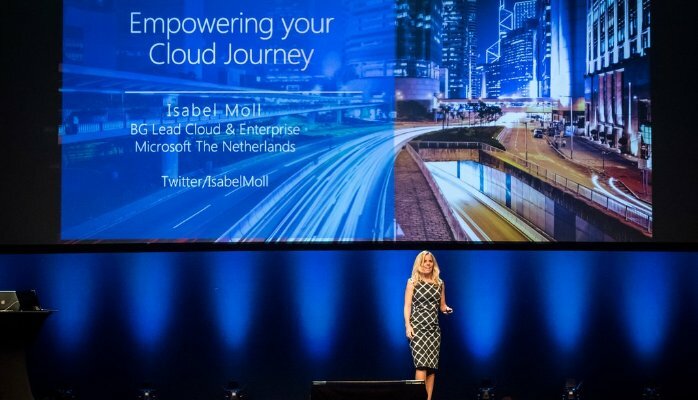 Why did I choose this job, Business Group Lead for Cloud within Microsoft? What does my job look like? These are simple questions, you would say, however, only the first question is simple to answer. Yes, my job is fun, great fun! It took me a while to reflect on the other questions. In the meantime, I was reading two books, A Cloud For Global Good by Satya Nadella and Brad Smith and A Growth Mindset by Caroll Dweck. Reflecting while reading, I hear you think…. yes…. for me it works, it is such a powerful way to structure my ideas and thoughts, it supports my creativity and in the present also inspires me to write my own story. So I read a lot, I always did, from of the day I could read. Getting back to the questions, starting with the why – “Why did you choose this job?”. Actually, I did not choose this job or any job, I followed my purpose. My purpose from of the start of my career was making a difference by using my passion and my talents. My passion has always been technology and learning new things and with the speed of technology changing there was always something to learn. Especially the way technology is impacting people and empowering organizations to reach its full potential. The passion for learning and technology is something that I was brought up with. My father, who was a teacher, built a program for the children of his school who had a very hard time to learn to multiply. One day he asked me if I could test the program he made, before he took it with him to school. While testing his program, I experienced something new, learning became a game with rewards. It made you want to practice and thus learn over and over again. A few weeks later I went to his school and saw the impact he made, he taught every child to multiply, but the most impactful thing I saw was the growing self-esteem of those children and the new born interest to learn more and work harder to get even better. It was such an easy program, but so powerful. From then on, my father continued to develop new ways for children to learn in different subjects and I was allowed to test all of these. Years later when I was studying at the University of Applied Science – Marketing & Research, I chose a graduation paper in IT, since I was convinced about the fact that there was so much to gain if customers would understand how they could make their work life easier with IT and how it could help them optimize their processes. Of course, I could have done an assignment for cool brands like Giant, Heineken, Phillips or ABN, but my idea was that I would have much more room to learn and discover within the IT spectrum. On the other hand, I could add so much more value to help them discover the needs of the customer, how to position their product and/or to understand in what way and how to improve their product. After 6 months, I graduated with a great first working experience and a mission to add value in IT and with IT. Ever since I got the opportunity to add value in great IT roles and assignments, develop different expertise’s and discovering new possibilities every day. The great thing of being a woman in IT today in comparison to when I started, is that it has unlimited potential. There is no limitation in what you can do with IT to empower you, so it is all about imagination, creative power and with that real innovation, which are often assigned to the right brain hemisphere and typical female gifts. My talent is creativity, mostly powered by associating and connecting things, people and situations, looking through different lenses, researching & analyzing data and on the other hand, driving and leading change by guiding where and how to start and experiment. The fact we are living in the 4th Industrial revolution in which a range of new technologies are fusing the physical, digital and biological worlds, impacting all disciplines and industries combined with a passion for technology and talent in creativity, makes that I am like that child again allowed to test this great game for her father. My day is filled with analyzing data, interesting conversations with teams, customers and partners, workshops, speaking on events to tell the story how to drive digital transformation and the powerful possibilities of Cloud & Data and supporting ISV’s and startups to bring their new born ideas to life. The idea we can create so much value with IT by connecting all the things to the cloud, analyzing and combining all sorts of data, getting new information on which we can build relevant new ideas, products and services, makes me smile. I have so much room to use my talent, add value and on the other hand learn and grow. If you have this talent for creativity, data science, a passion for innovation and technology, IT is a lovely place to be. Reading back my story, I need to answer the first question again: Is it Fun? No, it is not fun, it is LOVE, I LOVE my job! Do you?